Over the last week, we’ve been user-testing some features which we hope to introduce in the future. Some of these features are still in very early stages of development, so it may be awhile before our Mark2Curators start to see them. 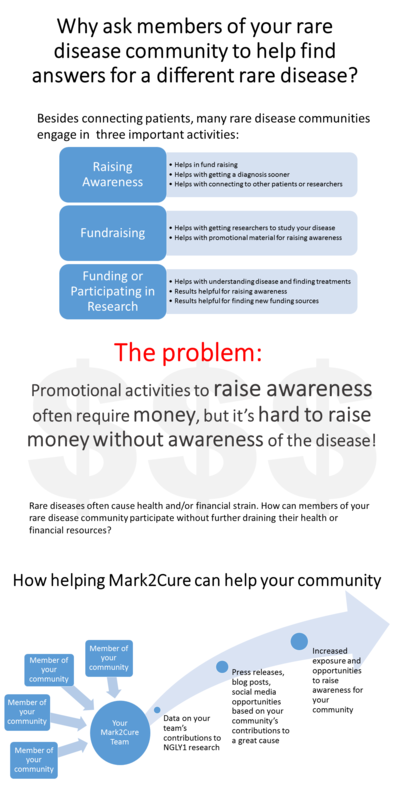 Since some of our Mark2Curators are also members of other rare disease or patient communities, we’d like to reiterate how Mark2curators could leverage their participation to make a difference for their community. As mentioned in last week’s blog post, we have team features which can be used by a patient community to guide the future directions of Mark2Cure. Additionally, there are opportunities for teams of Mark2Curators to raise awareness for their organization (it doesn’t have to be a rare disease community). See the blog post or view these images on why you should bring your community to Mark2Cure and how to build your community team in Mark2Cure. Lastly, we can’t emphasize enough the importance of each Mark2Curator’s contributions. Each quest a Mark2Curator completes will help convert something known into something more meaningful! Even if a Mark2Curator isn’t part of a team, that curator can still make a huge difference and influence the Gene Wiki Review series. What is the Gene Wiki Review Series? The Gene Wiki Review Series is the product of a partnership between the Gene Wiki Initiative and the journal, GENE. By leveraging this partnership, we can invite experts to edit bare-bone, gene-specific Wikipedia entries. For example, the Wikipedia entry for NGLY1 was recently updated by NGLY1 researcher, Dr. Tadashi Suzuki, as part of this series. If you’re a researcher working on NGLY1 or any other gene, please consider contributing your knowledge to help improve Wikipedia entries and make information more available to everyone! If you’re an information-seeking, avid Mark2Curator, we would love to invite experts to contribute on gene wiki entries of interest to you. The only way to show your interest, though, is to contribute!